Located in downtown Baltimore, M&T Bank Stadium and Oriole Park at Camden Yards are premier stadiums in the National Football League and Major League Baseball. Construction of both have helped revitalize the city. Camden Yards, home of the Baltimore Orioles opened in 1992, followed by M&T Bank Stadium in 1998. Baltimore was without professional football for 14 years after the Colts left for Indianapolis following the 1984 season. To lure a team back to the city, officials worked to have a new stadium constructed, a project that took nearly a decade to begin. In the mid 1990s, owner of the Cleveland Browns, Art Modell, wanted a new stadium to replace the colossal and deteriorating Cleveland Municipal Stadium. After failing to reach an agreement to build a new stadium in Cleveland, Modell moved the Browns to Baltimore after the 1995 season where local officials promised to build a new state of the art football facility. Officials in Baltimore decided to build a new stadium next to Oriole Park at Camden Yards. While the stadium was constructed, the Baltimore Ravens played at Memorial Stadium for two years, the previous home of the Colts before moving to Indianapolis. PSINet Inc., originally purchased the naming rights to the stadium, thus receiving the name PSINet Stadium. However, after the 2001 season, the PSINet name was dropped and the stadium was renamed Ravens Stadium. In May 2003, M&T Bank purchased the naming rights for $5 million annually over 15 years. Ray Lewis wins 2000 and 2003 Defensive Player of the Year. 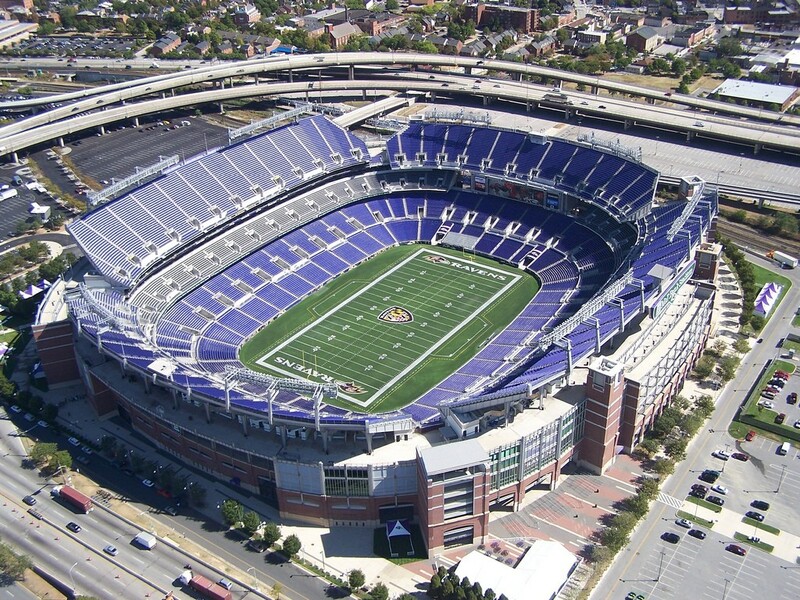 The Ravens inaugural first game at their new stadium was on September 6, 1998. 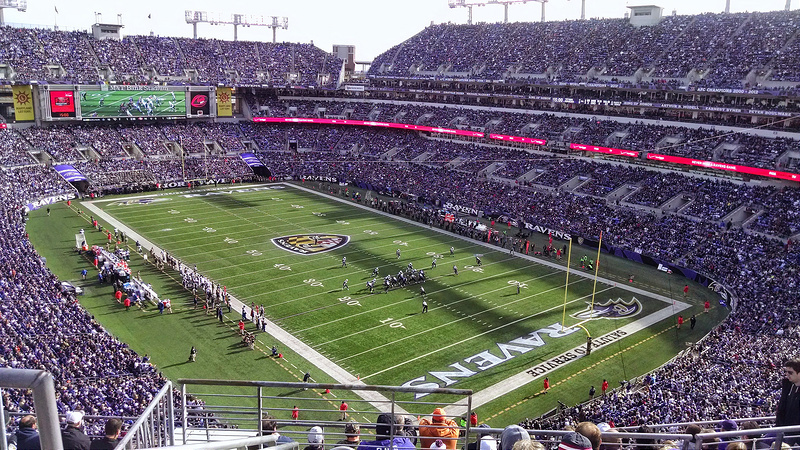 M&T Bank Stadium consists of three main tiers of over 71,000 purple and silver seats fill the stadium. The lower level of seats enclose the entire grass field, the club level seating circles the field, except beyond the end zones, where two massive 200 feet wide and 36-feet high 4K ultra HD video displays are located, and the upper deck extends around the entire field. It is broken into four sections. In each corner is an ultra-high definition 4k video board, each measuring 33 feet by 44 feet. Outside, the exterior of M&T Bank Stadium is built in correspondence with its neighbor, Oriole Park at Camden Yards. The facade consists of over one million bricks, several thousand pieces of bluff colored architecture precast concrete and prominent archways. M&T Bank Stadium includes over 100 luxury suites in two levels, 8,196 club seats, the Budweiser Backyard Bash, where fans can mingle and watch the pre and post-game shows on big screen TVs, and a Ravens Team Store.